SEOUL/BERLIN -- Samsung Electronics is in advanced talks to buy some or all of the operations of parts maker Magneti Marelli from Fiat Chrysler Automobiles, according to people familiar with the matter. Samsung is particularly interested in Magneti Marelli’s lighting, in-car entertainment and telematics business and could consider an acquisition of the whole company, the people said, asking not to be identified as the discussions are private. The deal could be worth more than $3 billion with a goal of closing this year, one of the people said, which would make it the company’s biggest-ever acquisition outside South Korea. Vice Chairman Lee Jae Yong, 48, is reshaping Samsung, South Korea’s biggest company, as he takes on more responsibilities once held by his father. He has sold off assets and narrowed the conglomerate’s scope as he seeks to bounce back from a downturn in the smartphone business. A move into automobile components would help decrease Samsung’s reliance on consumer electronics. Lee, who has been a director of Fiat Chrysler’s controlling shareholder Exor since 2012, would also position his company to benefit from the rising interest in cars from technology companies. Apple, Baidu and Google are pushing into automobiles, seeking to deploy their technology into new areas as cars become more advanced. Samsung Electronics had more than $70 billion of cash and marketable securities as of March 31, according to data compiled by Bloomberg. In addition to global leadership in smartphones, Samsung is the world’s biggest producer of memory chips and televisions. Samsung declined to comment in an e-mail statement. A Fiat Chrysler spokesman had no comment. Fiat Chrysler was the first major carmaker to strike a deal with Google on driverless vehicles and the company is in discussions with other technology companies, CEO Sergio Marchionne said on a conference call after the company’s second-quarter earnings results last month. After calling off efforts to pursue a merger with General Motors Co., Marchionne has made eliminating debt his highest priority before he leaves the post in 2019. Achieving the goal would put Fiat Chrysler in a better position to find a partner. Marchionne contends that the auto industry wastes too much money and needs to consolidate to finance investment in new technology. In December, Samsung Electronics created a team to work on automobile components, in-car entertainment and autonomous driving. It has also been charged with coordinating with other arms of the conglomerate making batteries and providing software services. Last month, Samsung’s Shanghai unit bought a 3 billion-yuan ($451 million) stake in China’s BYD to gain a slice of surging sales of electric cars. In 2009, Magneti Marelli and Samsung teamed up to develop display products for entertainment, information and navigation. Samsung, which is expanding global sales of its displays using organic LEDs and lighting solutions, could offer new light sources and bendable dashboards to design-sensitive luxury car drivers. Magneti has years of experience in satellite navigation, connectivity, infotainment and telematics systems, which offer connectivity with external electronic devices. Telematic devices allow in-vehicle access to specific services, including insurance, car parks and anti-theft security. An eventual sale of Magneti Marelli would help Marchionne in what analysts see as the most challenging plan of his five-year strategy, which include more than doubling net income: turning Fiat Chrysler’s 5 billion euros in net industrial debt into a cash pile of at least 4 billion euros. That compares with an average estimate of 3.81 billion euros of debt at the end of 2018 by 12 analysts. 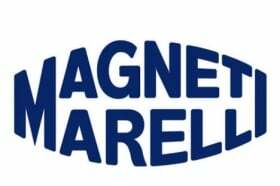 Fiat’s components business, which includes Magneti Marelli, Comau and Teksid, made 111 million euros of adjusted earning before interest and taxes on 2.43 billion euros of revenue in the second quarter pushed by "higher volumes" at Magneti Marelli, Fiat said July 27. Acquiring the business would immediately give scale to Samsung’s automotive ambitions through established brands, plants and distribution. A deal could open up access for Samsung to supply some of Fiat’s luxury brands, which include Maserati. Fiat spun off its Ferrari business last year. Such a deal would also be the biggest move into automobiles by the South Korean conglomerate since Samsung Motors went bankrupt ahead on eventual sale to Renault in 2000.